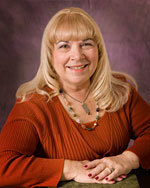 Barbara is an experienced Reiki Master/ teacher. She practices Traditional Usui Reiki, Karuna Reiki*, Shamballa Multidemential Reiki, and Ama Deus method of healing. Offering classes as well as healing sessions in Syracuse New York, her approach is simple yet practical. Her classes are relaxing, healing and fun. Barbara believes that Reiki training can be appropriate for people of all walks of life and she would be happy to introduce you to this healing art. Her knowledge and guidance will help you begin your own journey into self-healing and self-discovery. Currently, Barbara is affiliated with Hematology-Oncology Associates of CNY as a CRMT (Certified Reiki Master Therapist). She provides Reiki sessions to cancer patients. Passionate about her work, she enjoys helping people on their path to recovery. Aside from teaching Reiki, Barbara is also an accomplished writer, polymer clay artist, and intuitive reader. A clairvoyant since birth, Barbara’s fascination with psychic readings began in childhood as she watched her grandmother perform intuitive readings from an ordinary deck of cards. It wasn’t until many years latter that she was given her first deck of tarot cards. The cards were merely a key which opened a door to her own personal spiritual development. Under the guidance of her beloved Aunt Kay, an internationally known psychic, medium, healer, and her teacher, she learned to trust her own natural intuitive talents. Today, Barbara is grateful for her intuitive abilities and is willing to assist you find peace and happiness through her Spirit guided readings. Barbara’s psychic readings empower her clients and help them to find positive direction in their lives, and assist them towards the path that leads them to greater happiness.